In Chapter Seven of my novel, An Accidental King, my protagonist, the young British King, Cogidubnus, is staying in Rome as a guest of the Emperor Claudius. Retiring to his bed-chamber for the evening, after participating in the Emperor's Triumph, he is somewhat awed by the luxury surrounding him. 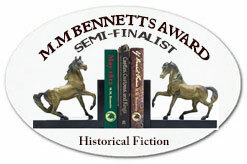 "On the floor was a bronze stand in which sat a miniature amphora, no larger than a jug, but made of dark blue glass rather than the normal pottery, and with figures around it picked out in white. It seemed to tell a story of love and marriage: a young man admiring a reclining woman beneath the shade of a tree; a flying cupid; a woman with a snake. I picked up the amphora. Filled with wine, it was heavy for its size." He pours himself a cup, and is as struck by the quality of the wine as by that of the vessel containing it. The amphora is a real object. We know it as the "Portland Vase," and it can be seen in the British Museum. It has a fascinating biography, insofar as we can reconstruct it. The Portland Vase. Photo: Sailko (licensed under GNU). As an object, it is completely unique. Amphorae - vessels for the storage and transport of wine, are almost invariably made of pottery. There are a handful of glass examples, and none quite like this. Its manufacture involved the blue glass vessel first being blown, then, after cooling, immersed in white glass. Finally, most of the white glass was chipped away, leaving only the figures remaining. 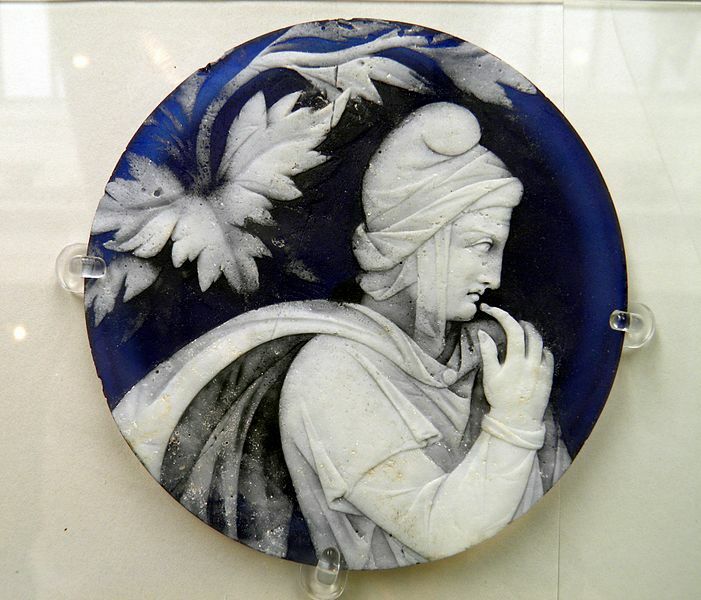 This is a technique more commonly used for making cameos from stone, and was rarely attempted on glass. This final stage is most probably the work of a Greek cameo master, Dioskourides, who was active in the late 1st Century BC. Although no record exists of the vessel having been commissioned, there is really only one person at the time who could have caused such an object to be made: the Emperor Augustus. The flying cupid with a torch clearly suggests a wedding, perhaps that of Augustus's daughter, Julia Major, with Marcellus in 25 BC. Scholars have debated the significance of the other figures for centuries. In the first picture above, does the woman beneath the Cupid represent Ariadne, Cleopatra or Thetis? Is the snake an asp, or does it represent Apollo? Some think the male figure to her left is Bacchus, others that it is Mark Antony. Is the reclining woman on the second photograph Ariadne, or Augustus's sister, Octavia Minor (abandoned by her husband, Mark Antony, just as Ariadne had been abandoned by Theseus)? Perhaps these ambiguities are intentional? Having been used, in all likelihood, to serve wine at an imperial wedding, the vessel is likely to have remained in the palace on Rome's Palatine Hill (my justification for placing it in Cogidubnus's bed-chamber in 43/44 AD). At some stage, it was either deliberately modified, or perhaps repaired, following an accidental breakage, giving it the flat base that we see today. The circular disc that formed the base of the vase, depicting Priam or Paris. It is unclear whether this was added in antiquity, or subsequent to its discovery. Photo: Carole Raddato (licensed under CCA). In 235 AD it was buried in the tomb of the Emperor, Alexander Severus, where it remained, intact, until its discovery during excavations in 1582. In 1601 it was in the collection of Cardinal Francesco Maria del Monte. It later passed into the hands of the Barberini family: a French scholar, Nicholas Claude Fabri de Peiresc saw it there, and wrote to his friend, Peter-Paul Rubens, suggesting that he should paint it (he never did). In 1778, the vase was acquired by Sir William Hamilton, the British Ambassador at Naples. Hamilton frequently sold pieces on to young men travelling through Italy on the Grand Tour, but few Grand Tourists had pockets deep enough to allow them to acquire such a work as this. Hamilton eventually sold it to Margaret Cavendish-Bentinck, the Dowager Duchess of Devonshire, who passed it to her son, the Third Duke. It was the Third Duke of Devonshire who lent the vase to the pottery magnate, Josiah Wedgwood, who kept in in his studio for four years, trying to perfect a ceramic reproduction. Wedgwood's limited edition of ceramic Portland vases appeared in 1790, and was the inspiration for the blue and white "Jasperware" range of Wedgwood ceramics which continues to be produced today. 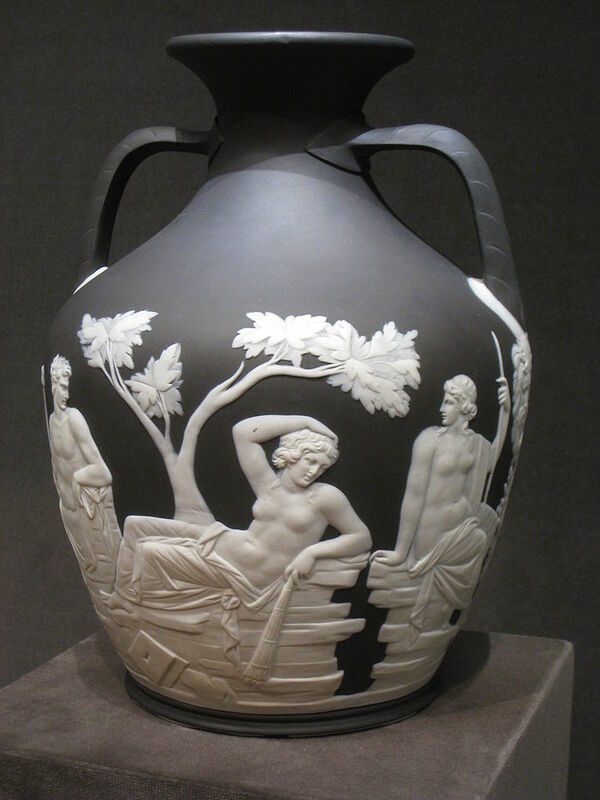 Ceramic copy of the Portland Vase produced by Josiah Wedgwood in 1790. Cleveland Museum of Art, Ohio. Photo: Daderot (image is in the Public Domain). The Duke was ultimately prevailed upon to place the vase on indefinite loan to the British Museum "for safekeeping," but this proved to be a big mistake. In 1845, a drunken student knocked it off its pedestal, shattering it. The staff of the British Museum repaired it as best they could, but an embarrassing tray remained of pieces that they were unable to fit back in. In 1945, the British Museum purchased the vase from the 7th Duke of Portland. It was taken apart by the museum's conservators, who managed to fit some of the "spare" pieces back in, but still the tray remained. Not until 1989 was the modern reconstruction completed, but I am assured that there are no "spare" pieces remaining. Mark Patton's novels, Undreamed Shores, An Accidental King and Omphalos are published by Crooked Cat Publications, and can be purchased from Amazon. How fascinating! So this is where the idea for those Wedgewood designs came from! I do have a couple of Wedgewood pieces that I received as gifts years ago, but I never knew what inspired them. How sad that a vase that survived a couple of thousand years, including what must have been around 150 years of actual usage was wrecked like that! You'd think the museum would have kept it in a display case, wouldn't you? Like Sue Bursztynski I never knew about the Wedgewood or any of the fascinating story, Thanks for another informative piece.